I’m a dangerous lady right now. I must be surrounded by lots of genuinely empathetic people who want to offer advice on how to deal with life, who may well have amazingly useful things to add, but I’m starting to feel that when people offer advice it is really for their own benefit, not for the benefit of the one they’re giving it to. Rushing up to someone with an expression of intense concern and telling them “You look like you’re in terrible distress! You need my help!” is more likely to produce the effect of being pushed off the nearest cliff (or ought to). If you really want to help me, why don’t you come to my house and do some dishes? The trouble is that many of us are so well trained in problem-solving, in everything from maths to mindfulness, that we probably do have a lot of helpful advice to give, if only we could find someone to give it to. The number of times that I’ve thought, “They really should try…”, I could become an agony aunt. In fact, if I charged for my services it might actually be of some use; of all the advice I’ve been given, only about 1% has stuck – the 1% I actually asked for. But problem-solving only works on non-human problems. Humans are far too troublesome to be able to come along and fix as though we were a crack in the road. Cracks in the road don’t have egos that bristle at the idea of being patronised or belittled. Giving advice is as good as belittling: you’re effectively telling a person that 1) they have a problem (which they might not have been aware of before; “I have a problem? Oh no!”) and 2) that they can’t possibly sort it out on their own. THEY NEED YOUR HELP. 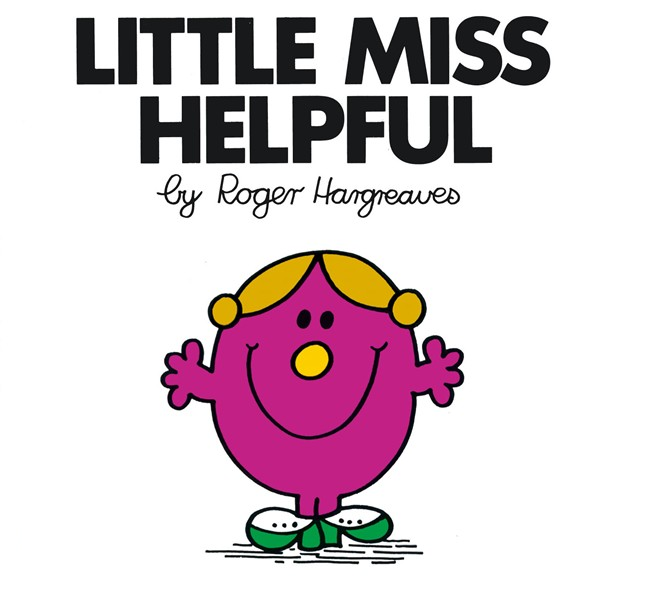 People such as these need to read that all-time classic of psychology literature, Little Miss Helpful by Roger Hargreaves. Really. It has cured me of the existential disease of wanting to help people who don’t want be helped. I can now quite calmly watch people walk into ditches without feeling the urge to set them straight. Perhaps I am also having a hint of apprehension at the fact that when another baby appears in the house, all of a sudden I will have thousands of well-meaning relatives bombarding me with tips on getting them to sleep well, how to deal with wind, what laundry detergent to use, which early educational tools will teach them six languages and calculus before they’re at kindergarten, and how to get back into pre-baby shape. The temptation is almost irresistible, especially when the target is a first-time mum, and I’ve fallen into its gaping jaws many a time myself. But one of the reasons I started this blog was because I realised how little advice I had to offer anyone, how pointless it is to try to preach, how the only way I would ever connect with anyone is to be frank about my own failings. With the added benefit of making me laugh at them. It’s what you might call a ‘desahogo’ in Spanish: a place to ‘undrown’ myself. The only time that problem-solving works on people is when you are left to your own devices and you come up with a solution yourself. Those are almost always the best solutions, custom-designed to your own situation, and they make you feel capable of dealing with the next problem that comes up. That’s the essence of creativity. Unless you need professional help, in which case, don’t ask advice from me. Eventually this hormonal phase shall too pass and I’ll go back to offering a strained, patient smile whenever people tell me “Why are you so pale/thin/tall/female/English? You need X, then a course of Y, and finally Z at dawn every day for a week. I used to be like you, and now look at me!” But for now I am in blunt mode, and since no-one is sparing my ego, I shall spare none myself. Remember, I’m carrying the child of Godzilla and I KNOW YOUR IP ADDRESS. The disease of “Good Ideas for Other People” is rampant here too. Thank you for your take. I can hardly wait to see baby Godzilla!